Check out this fresh and healthy salad appetizer recipe. Hosting a way-healthy crowd? You can’t beat this Celery, Radish, and Parsley Salad (see recipe below) from Cynthia Nim’s new cook­book Gourmet Game Night (Ten Speed Press, $18). Serve it in little spoons or make a big batch for a side salad. 1. Whisk together lemon juice, zest, and a good dash each of salt and pepper in a small bowl until the salt is dissolved. Whisk in olive oil; taste for seasoning, adding more salt and pepper, if needed. Toss radishes, celery, and parsley in a large bowl. Drizzle the salad with the dressing, and toss to evenly coat. 2. 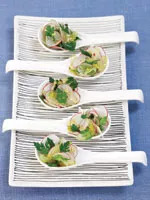 Spoon salad into 18 porcelain soup spoons (shown above, $2 each), and place them on a tray for serving. Note: You can make the salad up to 2 hours ahead. Cover it with damp paper towels and keep dressing separate; toss salad and dressing together just before serving. Reprinted with permission from Gourmet Game Night: Bite-Sized, Mess-Free Eating for Board-Game Parties, Bridge Clubs, Poker Nights, Book Groups, and More by Cynthia Nims, copyright © 2009. Published by Ten Speed Press, a division of Random House, Inc.